Last night we took my local nephew (he’s a lucky kid to be the only one that lives in Vancouver) to Screen Door in Portland for dinner. I had heard they have amazing fried chicken and, since he and my husband had the most amazing fried chicken they’ve ever had at Amy Ruth’s in Harlem over Spring Break, I figured they’d appreciate Screen Door. Ironically, no one had the chicken. *A note about the pics: Once again, I wasn’t expecting to take pics so we relied on my husband’s Nexus which takes lousy pictures in dim lighting. So sorry about the quality. When we arrived, there were a few people scattered about in the warm, dimly lit dining room. By the time we left, all the tables were filled and people were lined up at the front door. Tuesday night at 7 pm…that ought to tell you something about Screen Door’s food. 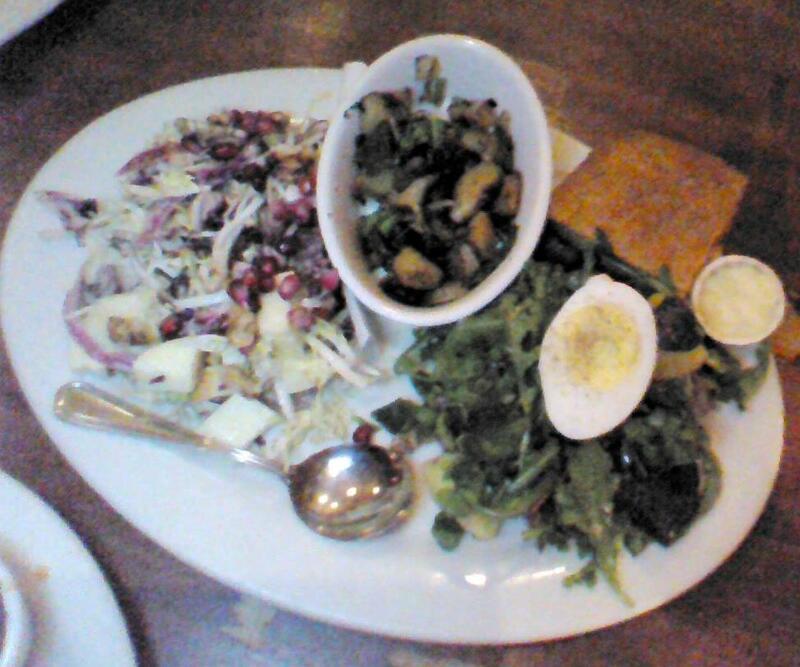 The spotlight at Screen Door is local and organic, from produce to meats. That’s exactly how I would describe the flavors in my Roasted Beet Salad. The arugula had a just-picked taste and the addition of potatoes was a nice, mild touch. Lining an interior wall of the restaurant are shelves of canned produce which speaks to the commitment that Screen Door has regarding local and organic. I had such a difficult time deciding what to order. Their Local/Organic menu had seven different options and none of them would’ve been wrong since they’re all vegetarian plates. The only thing that really stumped me was Trout Pecan on their regular menu. I don’t eat trout much but I really enjoy it and I’m sure this place would’ve turned out a wonderful plate. Our waiter was the deciding factor so I chose the Screen Door Plate which allows you to choose three house and/or local organic options. At the urging of my nephew, I went with Fuji Apple Waldorf salad tossed with grapes and pomegranate seeds. I paired that with the Winter Vegetable Hash and (previously mentioned) Roasted Beet Salad. The hash was so fantastic that I’d love to attempt to duplicate it. 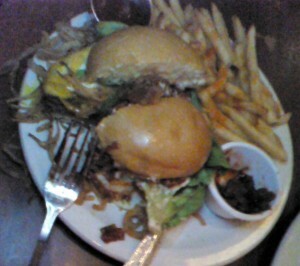 My husband was his wild and crazy self, opting for their burger garnished with a fried egg and fried onions. I suppose it’s because he lives with a gal who prefers meat not be brought into the house that he always orders a burger when we’re out. That makes him a terrific resource for what constitutes a good burger. His review of the Cascade Natural ground sirloin: It was “juicy as all get out” and he loved that there were four different hot sauces on the table because, aside from Datil peppers, it’s hard to make anything too spicy for Dan. If I was a meat girl, Riley’s Smoked & Bbq’d Beef Brisket was gorgeous and, judging from how little was left, he’d come back to Screen Door. The hock-stewed beans (which I don’t think it was suppose to come with?) were his second favorite thing on the plate. Given the option, he’ll usually choose bbq so, of course, the meat itself was heaven to him. He also enjoyed the potato salad representing his favorite food group-bacon. Unfortunately, we left Screen Door to go to another place for dessert (which ended up being a disappointment) but their dessert menu was as fresh and inspired as their dinner options.